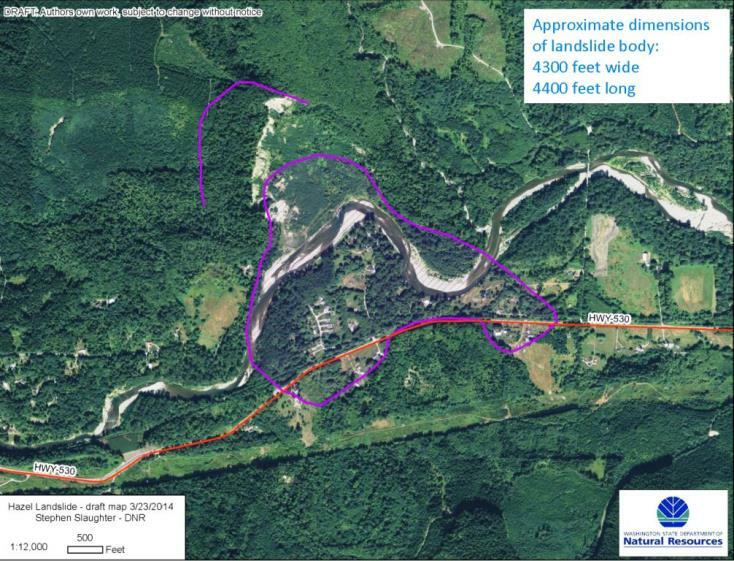 530 Slide UPDATE: March 28, 2014 — State Forester says landslide area was under protections put in place in 1997. More here. Aerial view of SR 530 landslide looking north. Photo: DNR. On Saturday, March 22, a massive landslide occurred near the small town of Oso, along the North Fork of the Stillaguamish River and State Route 530 in Snohomish County, Washington. Numerous lives were lost and many people remain missing. As search-and-rescue teams continue their important work, geologists are monitoring the landslide and the lake that formed behind the landslide debris blocking the river to ensure the safety of first responders and those living downstream of the impounded lake. Here, State Geologist Dave Norman of the Washington Department of Natural Resources (DNR) provides information about the landslide from a geological perspective. Q. What is the role of DNR’s geologists? 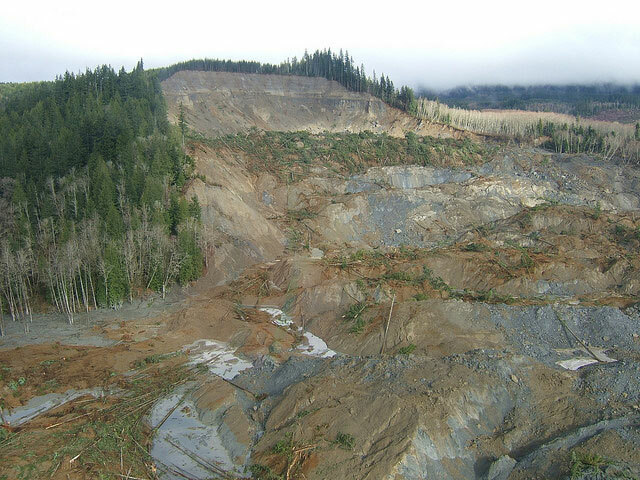 A. DNR’s geologists and staff are assisting geologists from U.S. Geological Survey (USGS), Washington State Department of Transportation, and Snohomish County to better understand the instability of the landslide related to potential hazards to personnel assisting with disaster recovery. DNR staff has been working with the Incident Management Team (IMT) to relay technical information as well as monitor changes on the landslide. Q. What is the area of the landslide? A. The landslide is approximately 4,300 feet in width and stretches across the North Fork of the Stillaguamish River approximately 4,400 feet. The debris field may be as deep as 30 to 40 feet and has blocked the river. The landslide volume is estimated to be as much as 6-7 million cubic yards of material consisting of sand, silt, and clay. These numbers are estimates and will change as high-resolution topographic data and aerial imagery become available in coming days. The blockage has impounded a lake 20 to 30 feet deep, extending several miles up the valley. The lake has flooded dozens of upstream residences. The current estimated volume of the impounded water is roughly 125 million cubic feet. Within 24 hours of the landslide, the river overtopped the debris field at several locations on the north side of the valley. On Monday, March 24, the river cut a 20-foot-wide channel across the northern portion of the valley and began draining the impounded lake. While the new river channel is eroding through the debris field and has released some pressure on the landslide dam, the channel appears to have temporarily stabilized since lake levels have not significantly lowered since the formation of the new channel. Q. What is the geological makeup of the area? A. The landslide consists primarily of sand, silt, and clay-sized sediments deposited by glaciers more than 10,000 years ago. This area and much of the valley have experienced numerous landslides in the past as recently as 2006, 1988, and 1967. These landslides were part of a significantly larger prehistoric landslide complex that extends throughout much of the valley. Q. How are geologists assessing the landslide area? A. Geologists have contracted for high-resolution terrain mapping and aerial photography of the impacted area. The data is currently being processed and will soon be available to the IMT to better assess the hazard. This information can show the maximum extent of the landslide debris and the thickness of deposits with very high accuracy. We are also monitoring the depth of the river. The USGS has installed additional stream gauges immediately upstream and downstream of the landslide to evaluate and measure changes in the height and volume of the river’s flow. The benefits of monitoring the flow upstream and downstream of the landslide is to help geologists understand how the North Fork of the Stillaguamish River is eroding through the landslide and better understand the risk of flooding to those downstream. Q. What do geologists expect with the rains resuming? A. Any increase in river flow from snowmelt or rainfall could accelerate the erosion processes of the debris field. Rainfall on the landslide scar and deposit also has the potential to enhance river erosion or mobilize material from the slide, some of which could form debris flows. Such flows present a hazard to rescue and recovery operations on or near the slide. We will continue to monitor water levels and discharge within the river and the impounded lake. Q. What is happening with the river because of the slide? A. The river is moving across the top of the debris field on the north end of the valley, about where the old channel of the river was before, and it appears to be reestablishing its original channel. Q. Is the ground dangerous for rescuers? A. The sand, silt, and clay that make up the landslide debris are saturated in places, making walking across the landslide very difficult and potentially dangerous. As of March 24, portions of the landslide were observed moving, although slowly. The depth of the wet debris and mud varies from 30 feet to a few inches. We are monitoring the stream gauges because new rainfall or snow melt can raise the height of the river, which could put emergency crews at risk. Q. What will geologists look for in the coming days and weeks? A. Geologists are monitoring the landslide and impounded lake to ensure the safety of first responders and those living downstream of the landslide. Landslide monitoring includes watching for the formation of tension cracks near the crown and along the flanks of the slide. Tension cracks could be the precursor for another landslide, though it is likely that any new landslide would be significantly smaller than the March 22 event. Also critical is monitoring of the North Fork of the Stillaguamish River as it erodes into the debris field. If the river erodes too quickly, it could lead to a sudden draining of the impounded lake, increasing the likelihood of downstream flooding. When the high-resolution terrain data is available, geologists will model the depth and area of the landslide to assist first responders in their efforts. The USGS has additional information about this landslide. Washington state geologist Dave Norman gave a news briefing Monday afternoon on what happened geologically in Saturday’s mudslide in Oso that has left at least eight dead and many more missing. View aerial photos in DNR’s Flickr album. More information from Snohomish County government, which is leading the search efforts.